Our cosy Farm Stay, known as "Kookaburra Cabin" is a self-contained NON-SMOKING two bed cabin set in a quiet location yet with easy access to all local amenities. FREE WIFI. Close to the stunning Northern Beaches only 10-15 mins to Freshwater Beach and 15 min to Manly. Enjoy waking up to the sound of kookaburras, watch the endless bird life from your private verandah, relax in the tranquility of our semi-rural haven just 15 mins by car from the surf/restaurants in Manly Beach and 40 mins by bus/car to the centre of Sydney. Perfect for a couple but also plenty of room for two couples or a family of four. One queen bedroom and one twin room are available (twin beds can be joined to make another double). Two car parking spaces are provided for the occupants of "Kookaburra Cabin". You will see water dragons sunbathing on the lawn, kookaburras, fairy wrens, honey eaters, owls, cockatoos, our chickens and ducks roaming freely around the property, our two friendly dogs, our two sheep and of course the inquisitive horse who lives in the paddock next door. 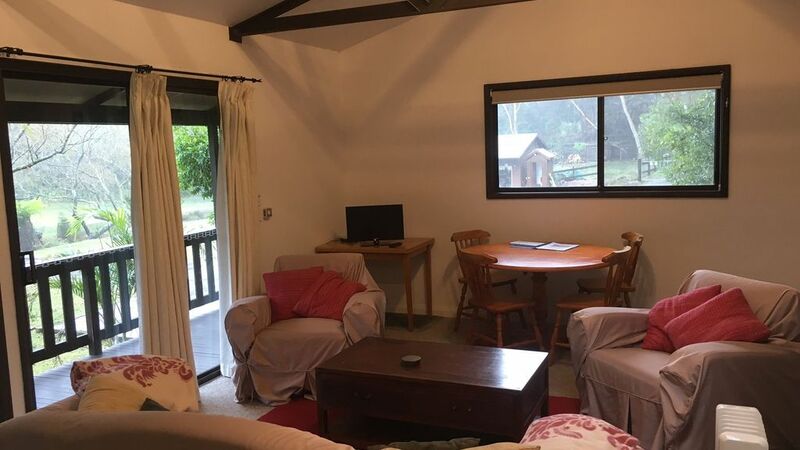 "Kookaburra Cabin" is situated in Oxford Falls, a semi-rural suburb just 15 mins by car from Manly Beach. There are awesome trails close to Kookaburra Cabin - including Oxford Falls, Red Hill, Manly Dam. Bus 136 goes from the end of the road to Manly or Chatswood (7 min walk from the cabin to bus stop). Bus 169 goes from nearby intersection to the City (10 min walk from the cabin to bus stop). Manly Ferry to centre of Sydney. "Kookaburra Cabin" is just 5 mins by car from Warringah Mall Shopping Centre where you can find supermarkets, chemist, clothing, gifts, library, cinema etc. Manly Beach is 15 mins by car and Dee Why Beach just 10 mins by car - both have endless cafes, restaurants, surfing and swimming. Narrabeen Lake is just ten minutes by car - perfect for fishing, kayaking etc. "The Falls Tennis Academy" is a 3 min walk from the cabin. Warringah Aquatic Centre (indoor and outdoor pools) is a 5 min drive from the cabin and Virgin Gym is a 3 min drive from the cabin. Golf: There are 4 golf courses within a 7km radius. Bush-walking: There are some superb coastal walks along the headlands, or else in nearby Garigal National Park or in Ku-ring-gai National Park, also not far by car. Kayak/canoe rental: At Narrabeen Lakes, Manly Wharf or in Middle Harbour at Spit Bridge. All linen/towels provided (washed weekly). Pantry stocked with herbs, spices, tea and coffee. Buy some fresh ingredients and cook at home or take advantage of the numerous beachside restaurants/cafes in nearby Dee Why or Manly. For long stays (over one week) washing/line drying can be offered at $20 per load or we can give directions to the local launderette. There is a TV, a large selection of DVDs and FREE WIFI is offered to guests. Mobile phone reception is also fine. No smoking AT ALL within the 6,500sqm grounds. **Please check calendar for availability** (top right) For your convenience we keep our calendar up to date. Vacancies are in white - nights booked are in grey. A cleaning fee of $60 is charged for each booking. We had 3 night stay at Kookaburra Cabin. Clean and tidy and very neat. Quiet location with every convenience. Very enjoyable and centrally located to Narrabeen. Hosts were great from the time of confirming bookings / directions to our actual arrival. Wonderful base from which to explore the Northern beaches. Thanks for hosting us. We live in a pet free unit, but I want my daughter to grow up like animal. Kookaburra cabin farm stay is first time my daughter lives surrounded by so many kinds of lovely animal. My husband and I also enjoyed our stay. We took a lot of photos to send to our relatives and for my daughter's grandparents to see. The photos came out very beautiful. Thanks for providing such a lovely place for my family to stay. They all really enjoyed it. Thanks Bella for the great stay at Kookaburra cabin! Our children loved having a mini farm experience, playing with the friendly dogs and fresh duck eggs for breakfast! Great location! Thanks Dean. You were perfect guests. It was lovely to see the kids playing soccer with you (and Pumpkin!!) Glad you liked the eggs. Hope the riding lessons are a success.